If you own a gift shop and want to expand your business online, GiftShop – WooCommerce Theme definitely is a right choice for you. GiftShop is a highly versatile platform to make a unique and eye-catching website for your gift stores or souvenir gift shop. 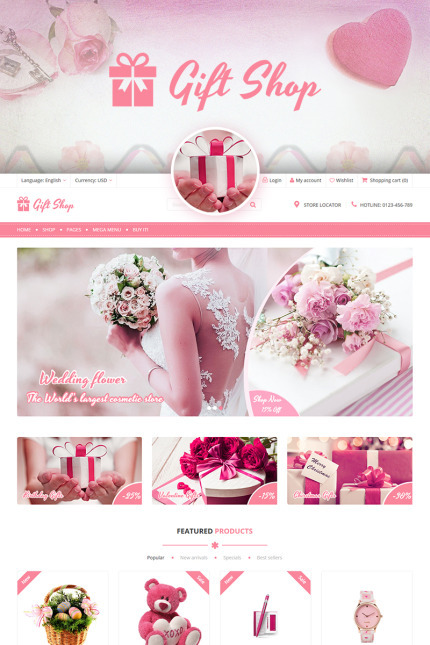 GiftShop theme has a fast and user-friendly options panel that permits you to customize and style your theme colors, fonts, change background and unique layouts. Entirely, a visually stunning layout with all the simple-to-follow and interactional appearance. Revolution Slider – this responsive blog WordPress theme comes with popular slider plugin included. Revolution Slider has supreme functionality and breathtaking effects. No need to purchase, it’s all in! Responsive Layout – GiftShop WordPress Theme has a responsive layout that will respond to your screen width and make content appearance be perfect on all devices, from large desktop screens to mobile phones and tablets. Advanced SEO for WordPress – this theme has an optimized code and structure, as well as fantastic Custom SEO options for every page and posts, allowing you to easily add important SEO meta data to all your website content. WooCommerce Plugin – through this you can categorize all your unusual gift items like cards, sceneries, decorative items, creative modules and handmade item in very elegant manner.